What kinds of sounds can you find in New York City? 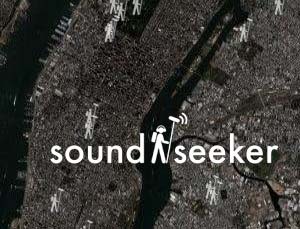 With Sound-Seeker, you can zoom, pan and search for sounds with interactive satellite photos or detailed maps of New York. Click on hot spots to listen to the recorded sounds of a location based on gps tracking. Sound-seeker was created using GoogleMaps and isn't viewable in all browsers. We suggest you use Firefox on the Mac and Netscape or Explorer on windows. Sound-Seeker is a map that privileges the ear over the eye. The project reaches across the city's geographic, economic, educational, cultural and racial divides. It is at once a historical record and a subjective representation of the city. It is what each user wishes it to be and it is ever growing, ever changing and totally interactive. While acknowledging that the visual sense often dominates, and conscious of the fact that the internet is largely a visual interface, we strive to create spaces that engage ALL the senses, and the mind, in a truly interactive way. Maps are tools for understanding the world from different points of view -- political, cultural, personal, and historical. Maps hold the power to shape the truth about the world and mapmakers shape the future.